Much ecological literature focuses on the effects that human actions have on species, habitats or ecosystems. Unfortunately, human effects on the natural world are often negative. Whether it’s deforestation, carbon emissions, plastic pollution or industrialized fishing to name a few, humans are having a tremendous impact on the planet. 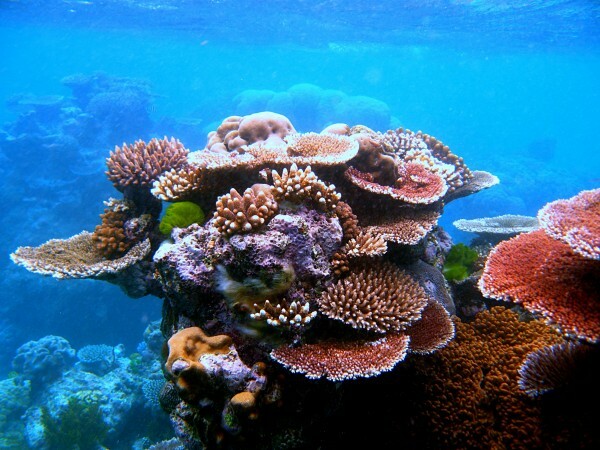 In the marine world, coral reef ecosystems have received particular attention. Beautiful in color, shape and the diversity of species they harbor, corals have been called the rainforests of the oceans. Corals have also earned the nickname “canaries of the sea” because, like the canaries miners carried underground to warn of noxious gas leaks, they readily respond to changes in environmental conditions, including temperature and light. Picture perfect, a healthy reef showing high diversity. Many scientific investigations have documented direct causal effects of human behaviors on coral reef systems: for example, aggregate mining, land runoff of excessive nutrients, and destructive fishing practices. Few, however, have taken a step back to look at how the presence of humans can affect the natural functioning of coral reef systems as a whole. What we haven’t known much about is the way environmental factors affect coral reefs in the absence of people. Presumably there are certain physical drivers for how a healthy reef community grows. What natural physical conditions lead to healthy reefs in environments untouched by human beings? What are the natural biophysical relationships in these ecosystems? A recent study published in the journal Ecography takes a wider view. Rather than identifying a particular negative effect of a certain human activity, the researchers investigated what the natural drivers are for a healthy coral reef ecosystem. With that knowledge, they could then describe how humans alter the way nature works in tropical coral systems. The Scripps Institution of Oceanography-based research team, in collaboration with the Coral Reef Ecosystem Division of NOAA in Hawaii, analyzed data from 39 different US-affiliated Pacific islands. Fifteen islands that are home to local human populations served as “impact” test sites. Twenty-four remote and unpopulated islands served as low human impact controls. 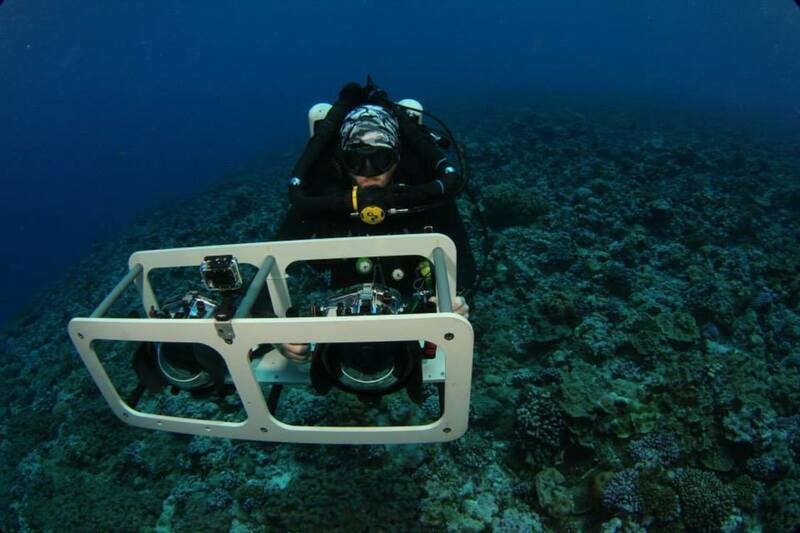 Lead author Gareth Williams surveying one of the 39 Pacific island reef sites. Using SCUBA and towing specialized camera gear around the circumference of each island, the team documented the corals and algae living on each reef – their so-called benthic communities. In addition, at each island they visited, the team used satellite data to tell them the sea surface temperature, irradiance (a measure of the sun’s brightness), wave energy and level of chlorophyll-a (how productive the water is). Few, if any, previous studies have been able to document the “natural drivers” of benthic communities on coral reefs because study sites are too often confounded by human impacts. This study is among the first. The team found that a coral community’s composition was determined by the environmental parameters they measured at each site. But this connection held only for the unpopulated, low human-impact sites. Around the people-free islands, environmental measurements explained the benthic cover the team saw. For instance, coral cover peaked in warmer, more productive waters where the magnitude of anomalous wave events was low. At populated islands, however, the story was quite different. The benthic communities there were not determined by the same natural environmental parameters. 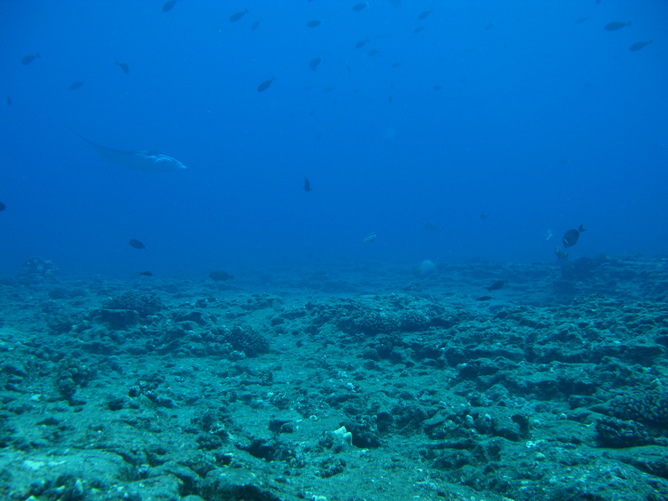 At these human-affected islands, the team either saw novel relationships emerge between the benthic communities and the background environment or the ability to explain variation in benthic communities between islands was lost. At populated islands, benthic communities no longer reflected the natural physical regimes in which they were found. Study leader Gareth Williams and his team termed this “biophysical decoupling” – the natural links between the biological (in this case the benthic cover made up of corals and algae) and the physical (temperature, light, productivity and wave energy) becoming disrupted in the presence of human impacts. Lifting anchor on the dive vessel after a round-island survey. Williams et al. present crucial baselines to identify the drivers of natural variability in coral reef benthic communities across the Pacific in the absence of local human impacts. Such work gives us a glimpse into the forces that structure ecological communities in a world without humans. It also highlights the fact that not all reefs look the same; management targets for coral reef ecosystems therefore must be context specific. Importantly, this research suggests that at populated islands, coral reef benthic communities are not determined by the natural surrounding environment, but by something else: human presence, or at least impacts associated with human presence.